If you have a home loan, you may have come across the terms ‘refinancing’ or ‘re-mortgaging’. These terms refer to the process of switching home loans for the purpose of saving money, increasing flexibility, adding to the loan amount or consolidating debts. Refinancing has become particularly popular in a low interest rate world because the significant difference between high interest rate lenders and low interest rate lenders can greatly affect how much you could pay for a home loan. For example, if a borrower had a $600,000 home loan with a rate of 4.5 per cent over 30 years, and refinanced to a 3.9 per cent rate, they would stand to save $210 a month. Discharge fees (average: $200-$300) – when you terminate your loan, you will likely have to pay a discharge fee to cover the paperwork your old lender has to compile. Upfront costs (average: $500-$600) – these include establishment fees, valuation and settlement costs. Break fees - if your current home loan is on a fixed rate you should contact your lender first and find out the break fee associated with switching. When considering refinancing costs, it is important to examine them with respect to the savings. Work out how much you will save in total over your first year, and how long it will likely take for these savings to make up for the switching costs. How long will it take me to cover the switch cost? Many lenders will cover your discharge cost and forfeit the up front cost to earn your business. It's often worth negotiating those fees before signing the loan contract. The Federal Government banned exit fees in 2011, removing one of the biggest barriers to switching home loan providers. Lenders can still legally charge a discharge fee, which is payable when you come to the end of your home loan, however these fees are relatively small at an average of $200-$300whilemany home loans don’t have them at all. Break fees are charged when a customer terminates a fixed-rate mortgage. The amount is determined at the time you decide to break the loan and is based on how much your bank stands to lose by you breaking the contract. As a general rule, the more the variable rate has dropped, the higher the fee will be. An ‘upfront’ or ‘application’ fee is a one-off expense you are charged by your bank when you take out a loan. The average start-up fee is around $500-$600, however there aremany loans on the market with none at all. If the loan you want includes an application fee, try and negotiate to have it waived. You’ll be surprised what your bankmay agree to when they want your business. One of the first questions borrowers who are considering refinancing have is "should I refinance?" Any ongoing and administration fees. To pay their loan quicker -Switching to a new home loan with a lower interest rate, but continuing to make the same monthly repayments could save you thousands, even tens of thousands, in interest charges. Itmay also allow you tofinish paying off your mortgage a few years sooner. To increase flexibility or features – When you first applied for your home loan, you may have been in adifferent financial position than you are now. Perhaps you've changed jobs, increased your income, or come into an inheritance. If you were simply looking for the lowest rate at the time, you may have missed out on a number of popular features lenders now provide,such as offset accounts, redraw facilities and the ability to make extra repayments. If you can afford to pay down your loan quicker, then thesefeatures may be able to help you save moneyover the longer term. To free up some equity – If you’ve paid off a chunk of your home loan, you may be eligible to extend your borrowing amount with a line of credit. The benefit here is that you could pay less interest by borrowing against your home loan than by borrowing on a credit card.Taking on additional debt always carries risks though, so before you go down this path, be sure to speak to a professional, such as a financial adviser, about the pros and cons for your personal situation. To consolidate debts – Some borrowers have multiple debts, such as housing loans, personal loans and credit cards.Bycombining those debts into the one account, these borrowers may be able to save on interest charges and fees from month to month, and relieve some of their immediate financial pressure. To take advantage of incentives – From time to time, lenders offer incentives to try and hook new borrowers. These incentives can be quite generous and range from cashback offers, to holidays, to new cars. Before you refinance to take advantage of an incentive, it’s important to look at the fine print and make sure the interest rate and fees for the new loan are reasonable and alignedwith your financial goals. It’s worth using a repayment calculator to determine how much more you’ll pay monthly, yearly and over the life of the loan, if your interest rate is higher than your current rate. To find a lender that treats them better – It's not unusual for borrowers to feel neglected by their lender. Perhapsthis means not getting a call back whenyou request it, poor customer service at a branch, poor notification of changes, or not passing on interest rate reductions. Feeling disenchanted with a lender is a common reason for refinancing for many Australians. It’s important to make sure before you switch loans that your new lender is an improvement on the old one. For many, that means making sure communication is strong and interest rates and feesare low. Mark* opened his first bank account when he was six years old, so naturally when the time came to get a home loan when he was 32, he didn’t think twice about banking with the lender he knew. After all, he trusted the big name bank, they only charged a few fees, and the bankdid much of the heavy lifting when it came to early paperwork. Five years into his 30-year loan term, Mark saw several news headlines that indicated interest rates were at record lows. To Mark’s dismay, his lender had only passed on one of two Reserve Bank interest rate cuts, which meant his rate was 0.75 per cent higher than those offered for comparable loans. What's more, he was paying an annual fee of $120, when many lenders did not have annual fees. Mark did the calculations and discovered he stood to save $3000in fees and $6450in interest charges if he switched loans. He spoke to his current lender and discovered he would have to pay $350 in discharge fees, plus $100 to his new lender in upfront costs, which he considered a small cost compared to the account-keeping fees he was paying. He switched loans and is using the money he’s saved this year for a weekend away. The time/effort involved – The main reason people don’t refinance is because they can’t be bothered, due to the perceived effortinvolved versusthe amount they’ll save. A RateCity survey found almost 40 per cent of borrowers cite this as a barrier. The chance the new lender will be worse than the old one – Any change is a risk and for almost a quarter of borrowers, the riskthat their new lender won’t be any better than their old one is enough of a reason for them to stay put. The hassle of unlinking bundled products – For those who have several bank products, including credit cards, transaction accounts and term deposits, all linked to the one lender, it can be a daunting task to either switch them all over to the new lender or to set up a new direct debit to your mortgage. However, many smaller lenders recognise this and have upped the ante on their customer service for bundled products. It can be as simple as filling out one form with your new lender and getting them to take care of a lot of the heavy lifting. It’s worth checking before you sign up to any new loan what sort of customer service the lender provides and how they handle mortgage transactions. The associated costs – Surveyed home owners cited the switching costs as one of their major deterrents to moving lenders. Their rationale is that the cost ofrefinancingwould outweigh the benefits they receive. However, in many cases, that’s not correct. Exit feeswere banned in 2011, which means borrowers now only have to worry about a discharge fee andany upfront fees of their new loan. While discharge fees tend to hover around the $200-$300 mark, the average upfront costs from RateCity’s database of loans is $500-$600. However there aremany loans on RateCity.com.au with no upfront fees at all. Given that refinancing isn't always a straightforward process, there are certain traps borrowers can fall into if they are not wary. 1. Adding smaller debts to your loan - Paying off a relatively small debt over a home loan's decades-long term mayrequiremany more repayments than you would otherwise make, costing more in total interest charges than paying the debt separately. 2. Borrowing more than you need - It can be tempting to extend your mortgage and borrow a bit extra to spend when you refinance, but over the long term this can cost you more in fees and interest to repay. 3. Falling for honeymoon rates- Honeymoon rates sound great at the beginning, but watch out for a high revert rate. 4. Refinancing to a longer loan term - Your repaymentsmay be lower to start, but you won't pay off the loan any time soon. 5. Accepting upfront fees instead of negotiating - Thiscan make refinancing cost-prohibitive. While there is no ideal time of year to refinance, reduced interest rates tend to follow a Reserve Bank interest rate cut. 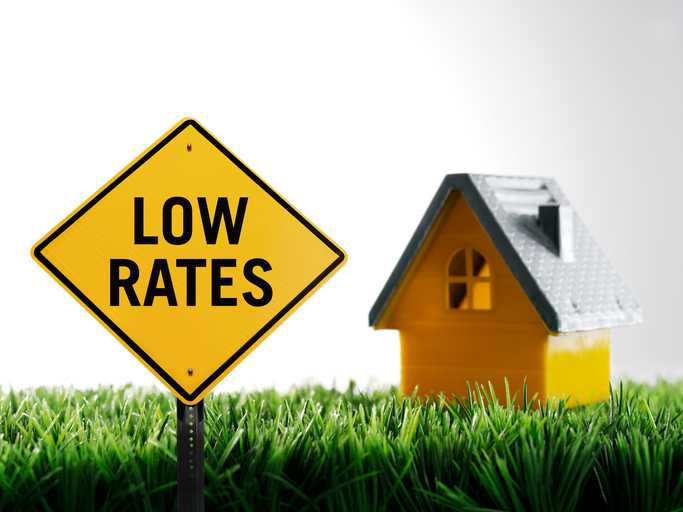 For example, in 2016, several loans listed on RateCity dropped their rates around May. Some home loan specials also tend to appear around the beginning of a new year. Given the paperwork involved in switching loans, some borrowers like to time their refinancing around holidays or long weekends. Should I worry about smaller lenders? Have a think about why you want to refinance - are you looking to pay off your home loan more quickly, reduce the cost of your monthly repayments, or access the equity in your property? It's also worth taking a serious look at your finances and assessing the affordability of switching home loans, taking the cost of fees, charges and more into account. How much effort is involved in switching my home loan? While the exact length of time can vary depending on your financial situation and your lender's refinancing process, refinancing could take anywhere from three days (for fast track refinancing) to four weeks (for standard refinancing). What if my credit card is bundled with my mortgage? Talk to your lender about their credit card options - you may be able to find another credit card offer available that suits your finances. There may also be better credit card options available from your new mortgage lender, or even a third lender. Find out if any fees or charges will apply for exiting your current credit card and/or taking out a new one. Consider what credit card balance transfer offers may be available, and remember to update any direct debits or similar services linked to your old card. If you're uncertain, consider contacting a financial adviser. Can I switch if I am on a fixed rate? It is possible to refinance a fixed rate mortgage, though it may end up costing more than you expect. Because a fixed rate mortgage involves agreeing to paying a predetermined amount of interest over a pre-set length of time, if you exit a fixed rate loan, you may be required to pay out the rest of the interest owing on the fixed period, or other similar fees. Check with your lender to confirm. What are the costs involved in refinancing? Refinancing may involve paying a discharge fee to your current lender when you exit your loan, as well as an upfront fee to your new lender. Depending on the lender's refinancing process, you may also need to pay additional fees to cover the cost of property valuation, and other miscellaneous charges. A quick comparison will revealthat some of Australia’s smallest lenders have more competitive interest rates than the Big Four banks. Sometimesinterest rates for comparable loansfrom smaller lenders are up to a whole percentage point cheaper. One of the reasons small lenders are able to offer cheaper rates is because their overheads are lower; some of them are online only, some have limited branches and others have less staff than some of their big bank competitors. This raises the question of whether you'rehappy to sacrifice the customer service and branch access from a larger bank in exchange for a cheaper rate. Ultimately, thiscomes down to individual preference. Many borrowers would prefer to be able to step into a branch when they need to and are happy to pay a little more for the privilege. Can I trust a smaller lender? If you’re worried about whether smaller institutions have looser standards, the good news is small banks and building societies are bound by the Code of Banking Practice and Mutual Banking Code of Practice, which means they have the same rules around disclosing fees and charges and keeping your information secure. If a smaller lender collapses, itsassets may be bought by another lender, and your home loan would be transferred tothis lender. Your loan amount will remain the same, but there will be a small administrative burden as you may have to change some of your passwords and banking details. There is also a chance that no new lender will buyyour old lender's loan book, and your home loan will be controlled by the liquidator. Refinancing, or switching loans, is not free, however many borrowers do it because of the potential to save money over time. The total cost of refinancing is estimated between $400 and $1200, based on the breadth of establishment, valuation, settlement and discharge fees from the existing loan. 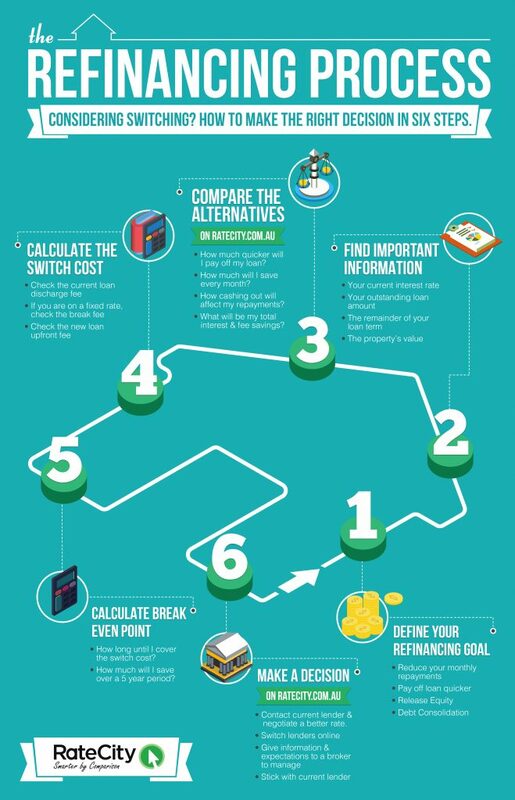 It will vary on a case by case basis, which means before refinancing, prudent borrowers should ask their prospective lender for a cost estimate and use a refinancing calculator to calculate how long it would take to recoup those costs. The frequency of refinancing is a personal choice, based on a number of variables for every individual. As such, there is no ideal equation for whether a borrower should refinance and how often they should refinance. RateCity data shows home owners with 30-year loan terms tend to refinance every four to five years on average. How often should you switch? Does Australia have no-cost refinancing? In your research on refinancing, you may have come across the term ‘no-cost refinancing’. No-cost refinancing sometimes occurs in the US and refers to a situation where the lender or the broker covers the associated costs, such as appraisal fees and settlement costs. Unfortunately, in Australia, we don’t really have no cost refinancing. The typical cost of refinancing is a few hundred dollars. However, it is still very popular, especially for borrowers with lengthy loan terms who can recoup those costs over a few months. Refinancing is certainly not for everyone; in fact for some borrowers, it will not be applicable or appropriate. Borrowers in the final year of their loan term – This is because the costs of refinancing could outweigh the financial benefit. Borrowers with a small loan amount – The fees may be more than the actual loan. Can RateCity refinance for me? RateCity is a financial comparison website, which means while we provide you with a list of prospective loans and lenders, we cannot refinance for you. If you wish to outsource the refinance process, a mortgage broker may be able to help. Will my current lender try to persuade me not to switch? It is possible that when you tell your current lender you have found a new lender with a better rate and/or fees, your current lender will try to persuade you to stay. After all, your current lender is making money from your business over a long period of time and should want to retain that. Before you begin the refinancing process, it could be worth speaking to your current lender about whether theyoffer flexibilityin their rates or fees. Lenders are well knownfor negotiating in order to keep customers. It’s often best to go into this process armed with information about comparable loans with low rates or fees and similar features towhat you currently have. Can I change jobs while I am refinancing my home loan? Given that the refinancing process can take up to a month from initial investigation to loan transfer, some borrowers could find it coincides with a recruitment process. If this is the case for you, you should definitely let your new lender know early in the application process. While it varies by lender, most lenders require refinancers to be in a permanent job with the same employer for at least 6 months before refinancing. Any interruption to this could reduce your chances of successfully completing the refinancing process. Can I refinance if I am on an employment contract? Some lenders will allow you to refinance if you are on an employment contract, as opposed to in an ongoing role. However, many lenders prefer you to be in an ongoing role because it reduces the risk that you will be unable to meet your repayments. Do I really need a valuation when I am refinancing? While some lenders do not require you to get a valuation before refinancing, the majority do. Rare exceptions may include when there’s been a recent estimate of a neighbouring property or a recent valuation of your property. In other cases, the lender will require a professional estimate of your property’s worth in order to establish how much they can safely lend you. On some occasions, the estimates are done remotely based on current knowledge of the geographical region, property size and condition. In other cases, someone will come to your home to value it. Will I have to pay lenders mortgage insurance twice? If your deposit was less than 20 per cent of your property’s value when you took out your original loan, you may have paid lenders mortgage insurance (LMI). LMI protects the lender in the scenario you are unable to repay your loan or recoup your borrowing costs due to low equity. For some borrowers, it’s a charge of up to $30,000. If you had a deposit below 20 per cent and have held your property for less than five years, there is a chance you could have to pay LMI again, to your new lender, upon refinancing. Before completing the application, ask your prospective lender whether this is the case. Some borrowers delay refinancing to avoid paying LMI a second time because the financial benefits do not outweigh the costs. Is there a limit to how many times I can refinance? There is no set limit to how many times you are allowed to refinance. Some surveyed RateCity users have refinanced up to three times. However, if you refinance several times, it could impair your credit score. Lenders assess your credit score when you apply for new loans, so if you damage it, you may not be able to refinance if and when you really need to. Before refinancing multiple times, you should get a copy of your credit report and ensure it’s in good shape for future refinances. I have a poor credit rating. Am I still able to refinance? Some lenders still allow you to refinance if you have impaired credit. However, you may pay a slightly higher interest rate, higher fees or lenders mortgage insurance to make up for the risk that you may not be able to repay the loan. I can't pick a loan. Should I apply to multiple lenders? You should only apply to one lender at a time because you could end up in a scenario where you are accepted by multiple lenders and expected to pay multiple application fees. Also, making multiple loan applicatiosn (and potentially recieving multiple rejections) could risk lowering your credit score. If you are having trouble comparing two similar loans, it’s worth making a list offeatures and benefitsyou want froma home loan and numbering them in order of importance. Then, contact the two lenders and find out which of them could deliver you what you want. Can I estimate the value of the property myself? Unfortunately, you won’t be able to estimate the value of your home yourself. Will I be paying two mortgages at once? No; given the way the loan and title transfer works, you will not have to pay two mortgages at the one time. You will make your last monthly repayment on loan number one and then the following month you will start paying off loan number two. If I don't like my new lender, can I go back to my previous lender? If you wish to return to your previous lender, you will have to go through the refinancing process again and pay a second set of discharge and upfront fees. Before you refinance, it’s important to weigh up the new prospective lender against your current lender in a number of areas, including fees, flexibility, customer service and interest rate. I am selling soon. Should I still consider refinancing? If you intend to sell in the next few months, it may not be the best time to refinance. That’s because the costs associated with refinancing, including upfront fees for the new loan and the old loan’s discharge fee, often take at least a couple of months to recover, even if you move to a loan with a better interest rate and lower fees. What is the process of switching mortgages? how readily available your documentation and personal finances are. Use tools such as RateCity's mortgage repayment calculator to compare your current loan to other alternatives on the market. Check the upfront fees on relevant loans and check if the new lender would be willing to cover your discharge fee and/or forfeit the upfront fee. Compare your monthly savings against the switch cost and calculate the amount of time it will take to make up for the switching cost and start saving. How long it takes to cover switch cost? Decide if you want to switch. If yes, you can choose to use a mortgage broker, or apply online via a website such as RateCity. Discharge fee: The cost imposed by your old lender for closing your loan (usually between $200 and$300). Break even point: How long it will take for the savings on your home loan to make up for the cost of the discharge fee. Net saving value: The amount of money you will save one year after the switch and 5 years after the switch after deducting the switch cost. If you areon a fixed rate, you should contact yourlender and check related break fees before switching. Before you go ahead with the refinancing process, you'll need to gather together the relevant information about your current home loan and property. This includes knowing your current interest rate, especially if you are looking to refinance to lower your monthly repayments. You can find this information by looking at your home loan statement, which will either be mailed to you or available through internet banking. 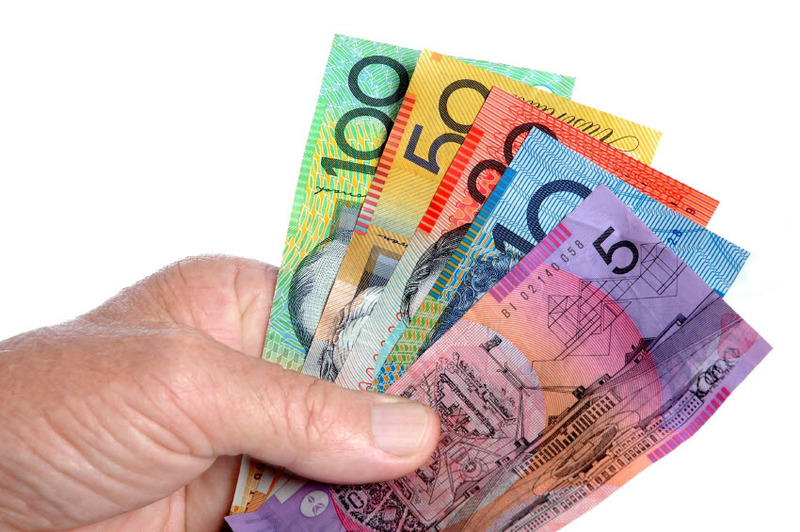 If in doubt, you can always call your lender and ask them to look up your rate. It is also essential to have an idea as to the current value of your property. Real estate sites like Domain.com.au and Realestate.com.au will provide you with an estimate of your property’s value, but for a more accurate estimate you can opt for a private valuation. When you apply for a loan, the bank will complete their own valuation of your property but it is good to have an idea of what your property is worth entering the process. Before you go down the path of switching lenders, it's important to consider all of the alternatives available for you. Switching home loans may not be for you and there may be better options for your goal and personal situation. Staying with your lender but asking for a discount on your interest rate. Some lenders offer re-amortisation or re-casting, whereby you can pay off a lump sum and reset your interest rate and mortgage repayments; it's worth thinking about whether you could save more by putting the money you would spend switching into paying down your principal. After investigating the other options, the next stage in the journey is to compare the cost of switching home loans. Your loan discharge costs - These are the costs you'll incur fromyour current lender when you transfer your loan. Your break fee (if you're on a fixed loan) - Because a fixed loan is essentially a contract for a set period of time, you may be charged a big fee if you exit from that mortgage ahead of schedule. Your upfront costs for the new loan - These include loan establishment fees and other charges. Another reason borrowers refinance is to pay off their loan at a quicker pace. Often this results from getting a pay rise, a bonus or an inheritance. In this scenario, the aim is to save themselves money by paying a higher portion of principal, as opposed to interest. As the below table shows, the repayment rate remains the same, more of the repayments are going towards paying off the initial amount borrowed. How long does it take to recoup the switching costs? RateCity analysis found it took borrowers on average between four and six months to recoup their switching costs. If you have only 5 years left on your loan, that may seem significant, but if you have 10 or more years, the impact may become negligible. - Identification details- passport, driver's licence. Sarah and James both work in economics and have a comprehensive understanding of interest rates and how they impact repayments. Therefore, they were both concerned when they realised their lender had only passed on half of the recent two RBA interest rate cuts. They knew had their lender passed on the full rate cuts, they would have been better off by about $177 a month on a $600,000 mortgage. However, for Sarah and James, it was a question of time versus money. They each work 50 hours a week and spend their weekends building their small business. In Sarah’s opinion, it didn’t make sense to sacrifice revenue from their side business for what could be a commensurate saving. James got in touch with a mortgage broker and discovered the process could be streamlined and he and Sarah would only have to provide two documents and sign two forms, while still saving about $100 a month based on the loans they qualified for. They wentdown the broker path. Josie* bought her first apartment in Sydney’s western suburbs in 2014 after securing a good deal from a mortgage broker. Her apartment was valued at $220,000 at the time of purchase and she was able to come up with a deposit of $11,000 for an owner-occupier loan. Earlier this year, Josie started to look for ways to reduce her mortgage payments and realised her interest rate of 5.25 per cent was well above the market average. She saw another lender was offering owner-occupier home loans for 3.4 per cent. The new loan would save her more than $200 a month. Josie met with the new lender about the loan and provided the relevant documentation. Given that she lives in a high density area, her new lender required an onsite valuation, where they assessed the land size, the off-street parking and the number of bedrooms. Take out lender's mortgage insurance – Given that Josie has less than 20 per cent equity and regulations have changed around loan to valuation ratios, the lender required further protection. For a few thousand dollars, Josie could elect to buy lenders’ mortgage insurance. Wait a little bit longer before refinancing to build up equity – Even a couple of years could see Josie hit the LVR requirements. Dispute the valuation report – If Josie felt the valuation underestimated the property’s value, she could request a second valuation, but this could see her pay a second fee. Ultimately, she chose to wait an extra two years before refinancing. With the above to aid you, the decision should become fairly clear cut. How much time does it take to refinance? Fast track: Lenders offering a fast refinancing track can complete the entire process for you within three days. Standard process: The standard refinancing process usually takes between two to four weeks. This process does not require more effort on your part; it's just structured differently. Once you're ready to refinance, use RateCity.com.au to locate your ideal loan based on your personal financial situation. your future plans for the property. The reason they ask these questions is to ascertain whether you’re a suitable candidate for finance from their perspective. It’s important at this stage to confirm how your lender deals with employment loss, loan defaults and whether they offer repayment holidays. It’s also a good time to talk about any fees you will be charged at the onset and termination of the loan, as well as any ongoing charges. If your new prospective lender has deemed you a suitable candidate and you’ve deemed them a suitable lender, you can proceed to the next stage of preparing your paperwork. The documents you will need include, but may not be limited to: identification details, your past loan statements, employment letters and pay slips. Some lenders require this paperwork to be delivered in person and signed by a Justice of the Peace, while others accept documents scanned online, or by post. One of the last suitability checks your lender will require is a valuation of your property. This is to ensure you have enough equity to secure the loan. Sometimes lenders will also want to ensure your local area is increasing in value in case they have to repossess and sell your property. Essentially, they want to know they can recoup their investment. How the property will actually be valued varies by lender. Some lenders will want someone to look inside, others will be comfortable driving by, others can do the evaluation remotely. It's worth noting that you will likely be charged a valuation fee when you refinance, which is usually between $100 and $400, though some lenders will provide your first valuation for free. If the valuation determines you have less than 20 per cent equity, you may be required to pay lenders’ mortgage insurance on your new loan. Within a few hours to a few days, your prospective lender will be in touch to let you know the status of your application. If you are approved, you proceed to the next stage of transferring the title from the old lender to the new lender. If you are rejected, it’s worth getting back in touch with the lender to see what happens next. If you have been rejected because you do not have enough equity in your property, you may be able to pay additional insurance to secure the loan or secure it against a different type of equity. Some lenders also have valuation appeal processes. After your loan has been approved, you will need to sign some discharge paperwork, then your existing mortgage is transferred to your new lender. This process can take up to two weeks. At this stage, you may need to pay a discharge fee. Your final stage of refinancing, the settlement involves paying your upfront fees and setting up your mortgage direct debits. NOTE: Your time commitment estimate is how many hours of your time each stage of refinancing may take up, according to our survey results. It does not include wait times you may incur as your lender assesses your application. What is the Fast Track refinancing process? The Fast Track refinancing process is a way ofswitching to a new lender in a total of three days. It is offered by lenders as a wayto reduce the time between you making the decision to refinance and them closing the deal. The benefit for you as a customer is that you can have the process completed in a matter of days rather than worrying about it for an extended period of time. What is the standard refinancing process? The standard refinancing process is when you complete the initial steps to apply for a new loan and then have to wait for your new lender to contact your current lender and arrange the terms of transferring the debt. This can take weeks during which time you will have to wait until your new loan is approved. As a result, the whole process usually takes between 2-4 weeks.During this time,your old lendermay offer discounts or incentives to encourage you to stay rather than switch. A 20-30 minute talk where the new lender will talk to you (usually over the phone) to assess your employment status, your finance andyour overall suitability for a home loan. You will be required to send to the new lender (by mail or online, depending on the lender) documents that verify your identity, your income and your overall financial status. Before the new lender approves your loan, the lender will assess the value of your property, often to ensure your borrowing amount is less than 80% of the property value. Remote valuation: Some lenders will do a remote assessment using digital means. This allows the lender to conclude the valuation process within hours. On the fast track option, lenders will then be able to pay off your old loan and issue a new one within 72 hours. Physical valuation: Other lenders will send a professional to assess the value of your property, which can slightly prolong the process as the new lender will need to coordinate a suitable valuation date with you. When this is done, a valuation fee will need to be paid. Some lenders carry that cost while others will charge you a valuation fee.Most valuation fees will be between $200 to $500. Following a successful valuation, the lender will approve your loan. On the fasttrack this can be done within 72 hours, whileunder the standard process it can take 9-14 days. The lender will require you to sign and send the new loan documents. Some lenders allow you to dothis online while other require you to send these documents by fax or by post. Fast track will allow you to get your old home loan paid and new home loan issued within 72 hours when no physical property valuation is required. Loan approval through standard refinancing process usually takes between 9-14 days. However in some cases this could take longer. Once you send back your loan documentation, the new lender will pay the old lender your outstanding mortgage amount (plus an amount to cover setup and discharge fees). From that moment, your old loan is paid and a new loan is set up. From your standpoint at that stage (72 hours in) the process is done. However the property is still under the ownership of the old lender. It takes up to two weeks for the old lender to change the property ownership to the new lender. The title insurance protects the new lender for instances where for some reason the ownership of the property has not been transferred. Some lenders carry the title insurance cost while others charge you a title insurance fee. This fee is quite expensive and can range between $500 to $3000.